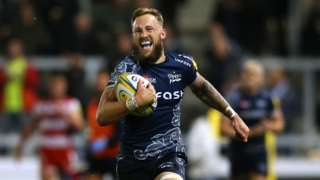 Byron McGuigan scores a hat-trick as Sale Sharks ran in seven tries to thrash Gloucester at the AJ Bell Stadium. That's it from us for this week. We'll be back on Monday at 7am with more news, sport, weather and travel updates from across the region. Police in Gloucester would like to hear from anyone who witnessed an assault in Metz Way in the early hours of Sunday morning, 24 September. Between 3.45am and 4.15am a woman was walking along an alleyway opposite Morrisons when she was grabbed from behind by an unknown man. The woman swung round and hit the man, but he punched her three times in the face causing a black eye and other facial injuries including a swollen lip. The offender is described as a white man, slim, about 6ft tall and wearing a grey zip-top hoody. M32 Bristol southbound severe disruption, between J2 for A432 and J3 for A4320 Easton Way. M32 Bristol - Slow traffic and one lane closed on M32 southbound between J2, A432 (Eastville) and J3, A4320 (St Pauls), because of a broken down vehicle. Cricket: Who made your county team of the season? With the county season finished for 2017, BBC Sport online users have chosen their Championship team of the season. And, maybe unsurprisingly, it features no-one from Somerset or Gloucestershire. A 38-year-old woman has been charged with fraud for allegedly posing as a medic and giving an injection to a member of the public at the Blenheim Horse Trials. Cassandra Grant, of Mulberry Walk in Bristol, has been charged with one count of fraud by false representation and one count of assault occasioning actual bodily harm in Oxfordshire. The charge of fraud by false representation is in connection with an allegation that Grant falsely claimed to be a medical professional at Blenheim Horse Trials earlier this month. The assault is in relation to an allegation that Grant gave a patient an intravenous injection of an anti-sickness drug at the horse trials. The jet engine of the Bloodhound 1,000mph supersonic racing car has was successfully fired up for the first time today. Bloodhound's team say the feat is a "huge engineering milestone" for the car, which has been assembled at Avonmouth near Bristol. The car's Rolls-Royce EJ200 jet engine, sourced from a Eurofighter Typhoon, was started up and taken to maximum reheat - also known as "afterburner". After a few more tests the Bloodhound will be taken to a desert venue in South Africa, where it is expected to reach 1,000mph in 2018, covering a mile in just 3.6 seconds at full speed. The project is the result of more than eight years of research, design and manufacturing. Bristol City midfielder Marlon Pack is suspended for the match against Ipswich Town this weekend, having been booked five times so far this season. Head coach Lee Johnson told BBC Radio Bristol: "We have proved that our game is effective and is difficult to play against. "We know we will get opportunities to score, because we generally do. "There is a good chance that we'll go in with the same squad [as Tuesday] except for Marlon Pack." Bath have prop Henry Thomas back from injury for Sunday's Premiership meeting with Wasps at the Ricoh Arena. Sam Underhill and Taulupe Faletau, who both missed the home defeat game against Newcastle, return to the back row, while Anthony Watson is the only change in the back line at full-back. Read the full story and get team news by clicking here. Police have released this CCTV image of a man they'd like to speak to following a serious sexual assault in Taunton. A 23-year-old woman was assaulted in a property near the town centre during the early hours of Saturday, 23 September. The victim is being fully supported and given access to any help she may need. Getting a bad tattoo is more permanent than most mistakes. When Gareth McCarthy from Filton was younger, he got a tribal tattoo which he quickly grew to hate. He has decided to have it covered over with a complete sleeve of Bristol history, showing streets which have been demolished and places now gathering cobwebs. He plans to expand the piece onto his chest when the tattoo is finished next year. Gloucestershire Constabulary has referred itself to the Independent Police Complaints Commission (IPCC) over its involvement in a pursuit on the M5 that ended with a man being shot and killed by officers. Their decision follows a similar referral by West Mercia Police. We have received referrals from West Mercia Police and Gloucestershire Police in relation to information received from a member of the public prior to the incident near Portishead. The member of the public made the report to West Mercia Police. This information was then passed to Gloucestershire Police. We are assessing the referrals to see what, if any involvement we should have in investigating the West Mercia and Gloucestershire response to that report. M5 Somerset southbound severe disruption, between J21 for A370 and J22 for A38. M5 Somerset - One lane closed on M5 southbound between J21, A370 (Weston-Super-Mare) and J22, A38 (Burnham-On-Sea), because of a broken down vehicle. Traffic is coping well. A case of "wrong place, wrong time" for the couple, said Yosemite park ranger Scott Gediman. Andrew Foster, originally from Cheltenham, was killed while his wife Lucy, 28, was seriously hurt when rocks fell from El Capitan. The pair, found with climbing equipment, are believed to have been scouting out the ascent of El Capitan from a trail when a "sheet" of granite plummeted from a height of 200m (656ft). The El Capitan rock formation is the world's largest granite monolith and one of the best-known landmarks in Yosemite. M5 Gloucestershire northbound severe disruption, between J9 for A46 and J8 for M50. M5 Gloucestershire - One lane closed on M5 northbound between J9, A46 (Tewkesbury) and J8 M50, because of debris on the road. Traffic is coping well. M5 Bristol southbound severe disruption, between J16 for A38 and J17 for A4018. M5 Bristol - One lane closed and slow traffic on M5 southbound between J16, A38 (Aztec West) and J17, A4018 (Cribbs Causeway), because of a broken down vehicle. Details of three of the victims of a fatal crash on the M5 in South Gloucestershire have been released by police. Formal identification has not yet been completed, according to Avon and Somerset Police. Four people died in the incident on Saturday, 16 September. The fourth victim was previously named as 46-year-old Adrian Beaumont, from Bristol. M4 Monmouthshire eastbound severe disruption, between J23 for M48 and J22 for M49. M4 Monmouthshire - One lane closed and slow traffic on M4 eastbound between J23 M48 and J22 M49, because of a vehicle fire. The 7th ordnance found in the Bristol Channel? Another unexploded bomb has been found in the Bristol Channel - possibly the seventh so far. They are being found by divers who are conducting a survey for the construction of the new Hinkley Point nuclear power station. The coast around Lilstock was used as part of a practice bombing range for the Royal Navy.